Hello Beautiful People, We are coming back with new Windows Article Where You can fix another new Error On Your Windows 10 Computer. If You are looking for How to Fix Driver Power State Failure in Windows 10 Then Here we are going to share the best tutorial where You can fix this error easily. If You are using Windows System, So Daily You are facing many error. So Here We Are going to share another popular error tutorial like Fix Driver_Power_State_Failure. When You are using Your Windows PC and Suddenly, You can getting Blue Screen On Your Windows PC. So You can be called them Driver Power State Failure Error. Driver Power State Failure Error is one of the popular and windows BSOD Drivers Error. Driver Power State Failure Error is caused by the incompatible driver. So Here We are going to share working driver power state failure windows 10 error solution. Here Below We Share Different types of Methods which you can use to fix this error. We are trying to give the best solution to our reads so don’t go anywhere we have best solution for Driver power state failure error. Power driver state failure windows 10 Error is Caused by Many Factors but It will be possible by Incompatible drivers and Windows Older Version. If You are using Windows Older Version Then Quickly Upgrade to New Windows version. You can’t fix by Upgrading BOIS and Drivers. You have to Fix this issue by proper method because sometime The Error may be caused by Windows Operating System or Setup Which You are using. So Let’s Follow below steps and fix this error for Lifetime. First Enter into Safe Mode and Right click On The Computer > Properties. Now Click On Device Manager and Check Yellow marks sign On Any Hardware drivers. Select incomplete drivers and Uninstall it. Now Again Reinstall The Drivers. Restart Your PC, Go to Setting and go to System and Security. Now Check For Updates From Windows Updates. Then Click On System Protection and Select System Restore. Now Tap On Next and Wait for few minutes to Restore System. That’s It. System Will be Restore. 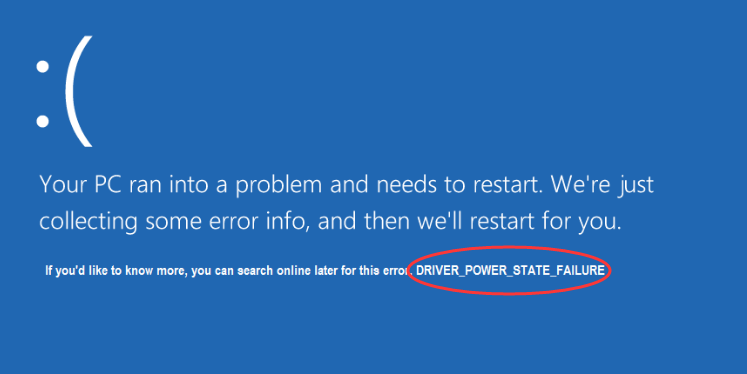 So Friends, If You are facing driver_power_state_failure windows 10 error and You can’t fix this error, So Don’t worry because here we share the best article on Windows 10 driver power state failure. During Browsing On Windows PC, Suddenly You are getting Full Blue desk Screen and You can’t do without Restart PC to fix this. But It can’t be fixed for the lifetime. So Check out above Full Article And Try to Fix This Error On Your Windows Device. If You like this Article Then Share With your friends and Also Comment us below for any Query. How to Download iMessage for Windows 10?